Does it surprise you to look at these two photos, side by side? Why waste a perfectly good idea, right? As my friend Mary Lou puts it, “God is the ultimate economist and consummate recycler.” When we have the ability to look with appropriate perspective, we may see the signature of the designer. But I wonder if the similarity isn’t just in appearance. Often the structure of a thing gives us clues to its function. Perhaps our growing understanding of the operation of the brain cell may shed light on interactions across our universe. Could what’s in us help explain what’s outside us and help us manage what’s between us? Is it so far-fetched to think that the God of the universe has intentionally planted the answers to our deepest questions inside us? Is He patiently waiting for us to find them? I, as a student of the human body, find myself both dumb-founded to consider this and excited to think it might be so. Are God’s answers hiding in plain view, waiting to be acknowledged? Certainly the beginning of new life begs us to consider God’s hand in its midst. Can there be anything more miraculous? Is there any more convincing witness to the hand of a Divine Creator? But let’s not stop at the miracle of the development of one body. All of us, the Church Universal, are being formed into the body of Christ. If we were designed to be joined and held together and thus to grow in love as we work together, our world today suggests we are far from God’s design. Yet, if God intends it, surely He has not made this an unsolvable puzzle. Perhaps the model for us as the Body of Christ is suggested in the workings of our own individual bodies. Allow me, if you would, a moment of speculation as I put on my hat as physiologist. Science demonstrates that the human body is so much more than its anatomy – more than the skin we can see, the muscle we can bulge, the pulse we can touch, and the breath we can take in. Underneath all of these functions are the delicate and highly regulated interactions which make them work: organs and organ systems made up of tissues and cells all contributing what’s necessary for life. The key to healthy life in the human body: cooperation among systems to co-exist while competing for a fixed supply of resources. Their successful interdependence is guided by a simple and familiar principle: to each according to its need. This delicate balance is maintained in response to the demands of life. Survival of the fittest is nonsense within the body because each part is necessary for the survival of the whole body. No two systems in the human body are alike. Each is specialized for an essential task; none “considers” itself above the rest. How could it? What good would the heart be without blood to circulate? What good would the muscles do without limbs to move? What good is our breath if it can’t deliver what it inhales and exhales? What good is our skeleton without ligaments to allow it to stand? What good is a brain without means to connect and communicate? What good is sight without vision or sound without hearing? Is this an echo of the message in First Corinthians? Could our bodies hold God’s message for our world? They demonstrate so beautifully and seamlessly the choreography of interdependent parts negotiating life, giving and responding obediently for the good of the whole. There is no greater and no lesser, no greed and no hoarding, no scarcity and no hunger. The better the parts work together, the more abundant is the life. Who in the world could have ever thought of that? If we are to believe that our God is the ultimate economist and consummate recycler who loves all He created, then God wastes not one bit. Each part is necessary and intended for the good of the whole. Each one is essential to the life of the body. Each interaction effects all others. Unique, for sure. Different, for certain. Interdependent, completely. No exceptions. It is the genius of perfect living balance: I take only what I need, so you will have what you need. Our ultimate survival may depend on it. So simple that any body can show you. What if we forget? What if we don’t get around to it? What if we’re afraid?…to tell them…until it’s too late. I live among the self-sufficient. Everybody’s “got this.” “I’m good,” they say. They don’t need my help, don’t entertain my suggestion, don’t want my advice. In fact, accepting help taints their ‘I can do this myself’ capacity, the capability we pride ourselves with here in America, land of the free, home of the brave. Independence is where we stake our claim. So, if I want them to know that there may be another approach or a new way, I am told I should ‘lead by example.’ That is acceptable, inoffensive and safe. If they notice, good. If not, well I’ve shown them. It’s not my job to turn them around. Here, I credit the Positive Coaching Alliance who suggests that we be sure to ‘tell them why you did what you did.’ This is especially true when our actions are silent. Speaking dispels misunderstanding. We don’t do it to tout what we did or draw attention to ourselves, but rather to be clear. And, to open the door for conversation and discussion. Why? What were you thinking? How did you decide this? What will you do now? Would you do that again? All valid questions. All essential so they can consider it for themselves. What would they have done if they were in my shoes? So many of us, though, shy away from this conversation. We want to let our actions speak so we don’t have. We like to quote the old standard of St. Francis “Preach the gospel at all times, and when absolutely necessary, use words.” Certainly yes. We don’t want to invade someone with overbearing expressions. Too many have used fear and force to do this. We would do well to be gentler, but we are challenged to go and tell. Is it cowardly just to witness with my ways and let them draw their own conclusions? Am I hiding in plain sight, choosing to keep quiet about my faith lest someone might catch me doing something unChristian and call me out? Are we people who hide behind our good deeds and figure that’s good enough for God? Or are we meant to risk letting the Jesus show so that when we explain the why behind what we did or the why not behind what we didn’t, we testify to the truth. I just love people who get creative about it. In fact, I am grateful because they give me ammunition and impetus to challenge myself to speak faith in a way that those who might not yet know the Lord will be tempted to consider Him. Now here’s someone who speaks it in style. 370Z style. What message are we leaving behind? How about this guy? 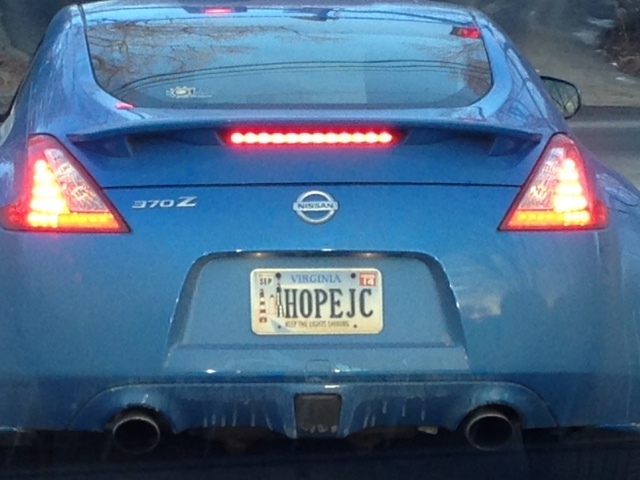 He drives around with the message on his plate. I posted it to my Facebook page. Why not? Easter is coming. A harmless question … for the win. But I had better “be prepared to give an answer to everyone who asks (me) to give the reason for the hope that (I) have.” (1 Peter 3:15) I have found that the right word is rarely as important as the timely word.